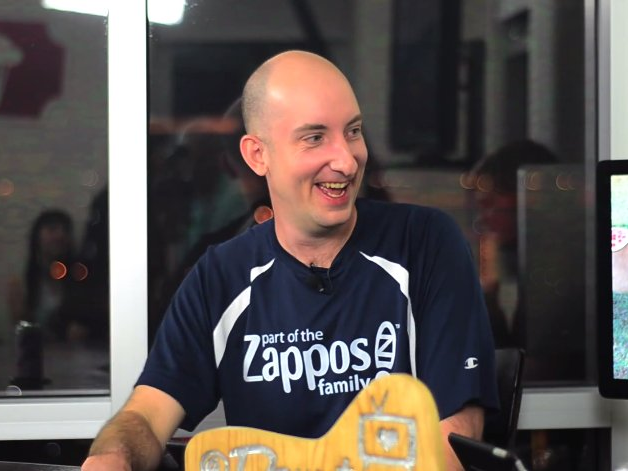 YouTube/Downtown PodcastJohn Bunch is in charge of leading Zappos’ Holacracy rollout. When Zappos announced late last year that it would eliminate titles and traditional managers from its company, some were sceptical about whether the online shoe retailer could pull it off. But the company tells Business Insider that 80% of its 1,500 employees are now working under Holacracy, a relatively new organizational philosophy meant to offer workers more flexibility by replacing traditional job titles with a fluctuating number of roles that each employee is assigned. Rather than being accountable to a single boss in a traditional hierarchy, each employee reports to the other people in their “circles.” Each circle has an organizational goal to achieve, and each role that people fill within the circle is a task necessary for accomplishing that goal. Of course Holacracy has not made Zappos a company entirely without hierarchy. The creation of new roles in a circle is left to a singular person known as the “lead link,” and many circles contain subcircles that they oversee. For instance, Zappos CEO Tony Hsieh is the lead link on the company’s broadest circle, the 10-member internal board, which is tasked with fulfilling the company’s overall purpose. John Bunch, the Zappos employee tasked with running the company’s transition to Holacracy, tells Business Insider that Hsieh’s power is different under Holacracy. However, Bunch declines to say whether Hsieh’s sway has increased or decreased at the company he joined as CEO in 2000 and sold to Amazon 9 years later for $US1.2 billion. 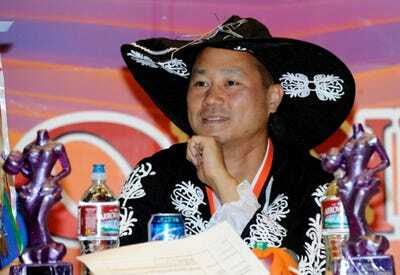 Hsieh holds “many, many, many roles” across the company, Bunch says, including being the “department expert” in a circle devoted to teaching other businesses about Zappos’ famously quirky corporate culture. And while employees no longer have titles internally, Bunch says they have what Zappos calls “#titles” to explain what they do all day to people outside the company. Getty Images/Ethan MillerTony Hsieh used to enjoy going to raves, an experience he says inspired the company’s culture of peace, love, unity, and respect. Thus far, Bunch says the company is on pace to meet its goal of having all of its employees operating under Holacracy by the end of the year. In his mind, one of the biggest challenges posed by the new system has been teaching employees not only what Holacracy is but how to use it, a process he compares to teaching 1,500 people how to speak a new language. The organizational philosophy, created in 2009 by software developer Brian Robertson, is characterised by a series of governance meetings in which circle members iron out “tensions,” the issues that are preventing the circle from running as smoothly as possible. Still, it’s unclear how much the company has functionally changed since it began its transition at the end of last year. Bunch says that several areas of the company have used Holacracy to make necessary changes to how they approach certain organizational challenges, but he declines to say which changes were made or which areas of the company were behind them. Additionally, Bunch says a lot of the company’s hiring, firing, and salary decisions are made the same way they were a year ago, but that over time, the company will evolve those systems to make them more in line with Holacracy. “I don’t want to paint a rose-coloured picture where I say everything is up and running and we’ve reached our highest potential, but we have seen some bright spots,” Bunch says. Ultimately, he hopes the move to Holacracy will pay off by helping the company better realise its goals of openness and excellent internal communication, and that the looser organizational structure will allow employees to push the company into areas it has not previously ventured into. “One of the markers of success for Holacracy would be to look back in five years and say, ‘Wow I would never have envisioned Zappos taking on that area, and look at them, they’re having success with it,'” Bunch says.